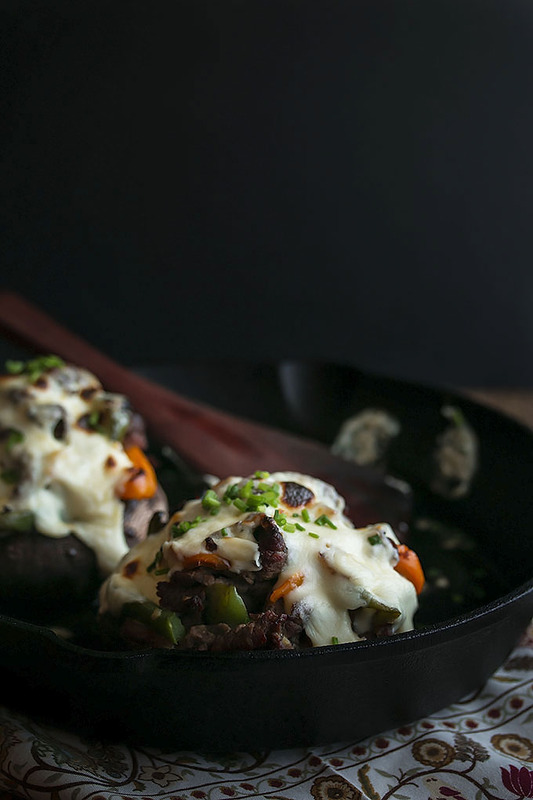 Healthy cheesesteak stuffed portobellos! 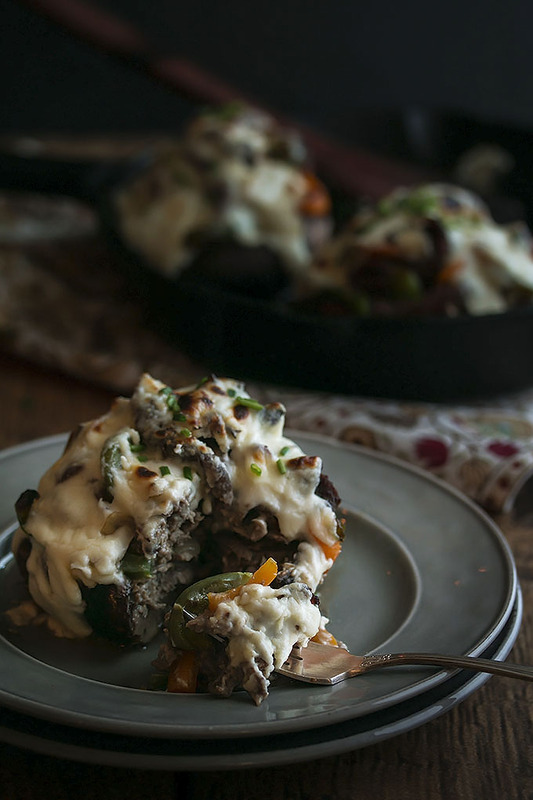 Big and meaty portobello’s stuffed full of thinly sliced steak sautéed with onions, peppers and jalapeños and then topped with creamy cheese sauce and baked till bubbling. Paired with a fresh green salad, this dish would make a perfect low carb dinner or lunch. This one is for all you carb conscious folks out there and also for all of you who love delicious food! 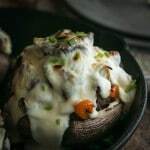 Big and meaty Portobello’s stuffed full of thinly sliced steak sautéed with onions, peppers and jalapeños and then topped with creamy cheese sauce and baked till bubbling. Paired with a fresh green salad, this dish would make a perfect weekend lunch or dinner with a few friends. Best served with a bottle of wine or one of our Sangria’s! Yes? We had these for dinner the other day and needless to say, everyone loved them. I mean, just look at that cheese! And I didn’t even feel guilty. 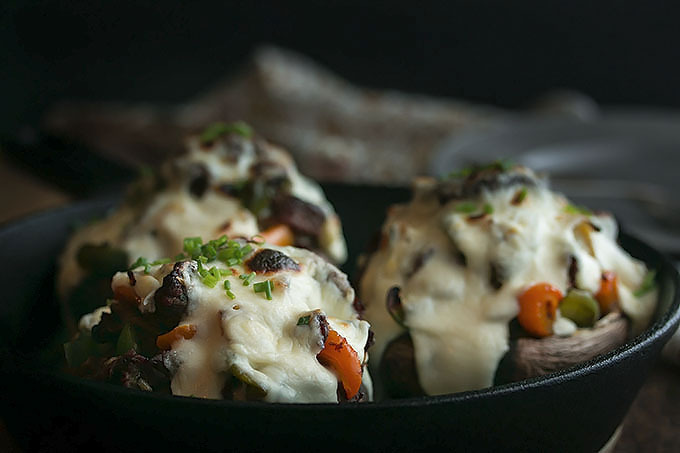 Yes, there’s a little cheese, but a little cheese sauce goes a long way and there’s so much goodness underneath that it doesn’t leave you feeling heavy or crappy. You have to love comfort food like that. The next day, Debbie and I sliced up the leftovers, mushrooms, meat and all, and made sandwiches for our men to take snowmobiling that weekend. They both have a little metal lunch container that hooks onto their sleds engine so it heats whatever is inside and makes for a hot lunch on the mountain. When they got home, they told us they had had a nice delicious surprise for lunch since they were expecting just regular old sandwiches. They raved about it so much that I think it’s safe to say that this recipe is a win all around. Marinate the steak. Slice the steak as thinly as you can, making sure you cut against the grain. Add the steak to a large bowl. Add the cornstarch, egg white, vinegar, worchestershir, montreal steak spice and herbs de province. Mix very well till all the beef is coated. Set aside for at least 30 mins. 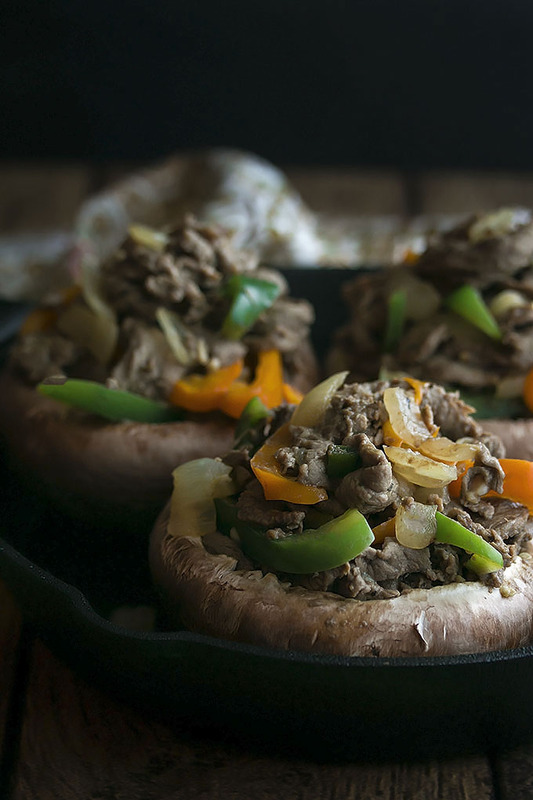 When you are ready to cook, heat a large skillet on medium heat. Add the olive oil, chopped onion, salt, garlic and jalapeno. Saute until the onions are translucent. Add the peppers and stir for a minute or two. Pour veggies into a large bowl. Drain the meat of any liquid and add it to the same skillet. Stir fry it until all the pieces are just cooked through. Do not overcook. Add the veggies back to the pan and mix well. Remove from the heat. Turn your oven to 350 degrees. 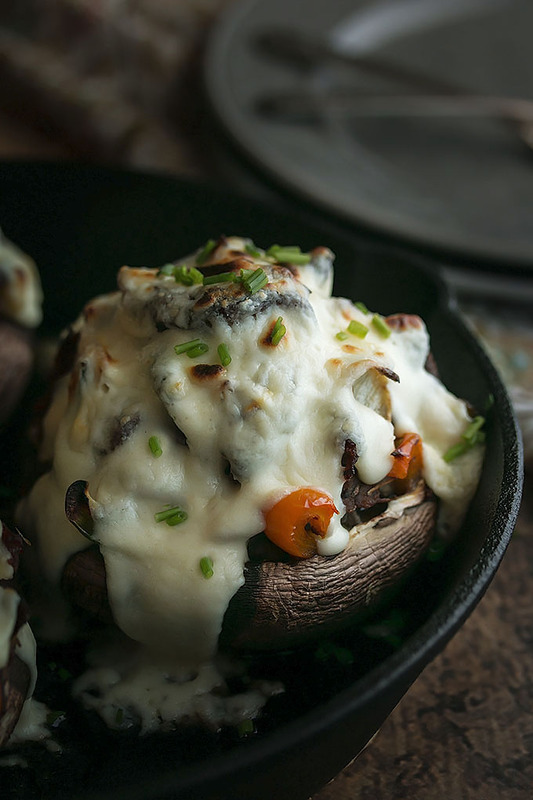 Add the portobello mushrooms to the pan and bake them for about 8 mins or so. Just so they start to get warmed through. Pull them out of the oven and pile each one with the steak mixture. Top with the cheese and throw them back in the oven. Bake for about 10 mins or until the cheese starts to get bubbly. If you like, turn your oven on broil for a quick min to brown the cheese if it hasn't browned already. Be careful not to burn it. Pull them out of the oven, top with chives if you wish and serve immediately.